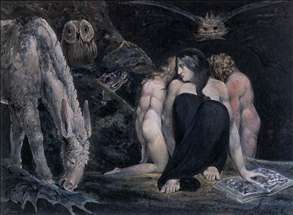 English artist, draughtsman, engraver, philosopher, and poet, one of the most remarkable figures of the Romantic period. From childhood he possessed visionary powers, and the engraving of Joseph of Arimathea, done at the age of 16, shows him already using a personal symbolism to express his mystical philosophy. His apprenticeship (1772-79) to the engraver James Basire (1730-1802), for whom he made drawings of the monuments in Westminster Abbey and other London churches, led him to a dose study of Gothic art and intensified his love of linear design and formal pattern. 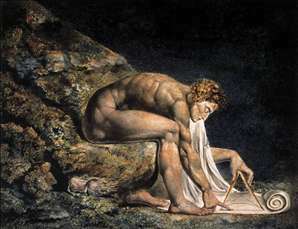 In 1779 he entered the Royal Academy Schools, but his relations with Reynolds were painful; later he was to find more sympathetic spirits in Stothard, Flaxman, Fuseli, and Barry. 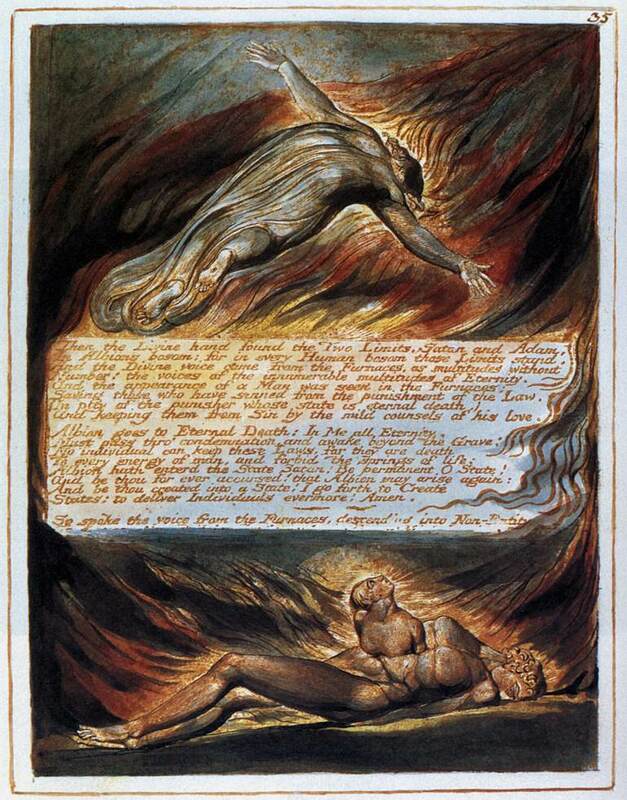 During the 1780s Blake worked as a commercial engraver, but from about 1787 he became engrossed in a new method of printing his own illustrated poems in colour, which he claimed to have been revealed to him in a vision by his brother Robert, then recently deceased. The first of these major works of illuminated printing , in which handwritten text and illustration were engraved together to form a decorative unit, was Songs of Innocence (1789). In 1793 with his wife, Catherine Boutcher, he settled in Lambeth. where he engraved his principal prose work, The Marriage of Heaven and Hell. He had little material success and in 1800, at the suggestion of William Hayley, poet and man of letters, he left London to settle for three years at Felpham on the Sussex coast. 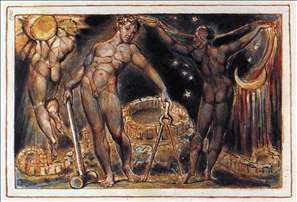 Here he continued a series of watercolours illustrating biblical subjects for his first and most generous patron, Thomas Butts, and also began to engrave Jerusalem, the last and longest of his surviving mystical writings. 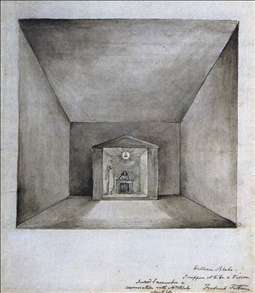 On his return to London, Blake made a series of drawings for Robert Blair s poem The Grave, and in 1809 held a small one-man exhibition for which he issued A Descriptive Catalogue, eloquently summarizing his aims and convictions about art. In 1818 he met John Linnell, whose sympathetic patronage ensured him a livelihood for the remainder of his life. 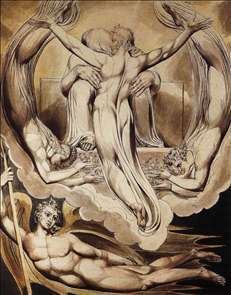 For Linnell he carried out his engravings for The Book of Job and his magnificent designs for The Divine Comedy, on which he was working up to the time of his death. 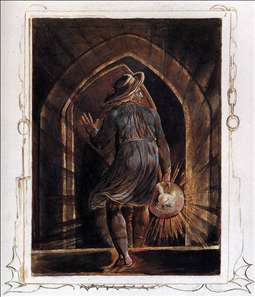 Linnell introduced to him a group of younger artists, including Varley, Calvert, and Samuel Palmer, who were inspired and stimulated by Blake s imaginative power. He thus passed his last years surrounded by a group of admiring disciples, who formed themselves into a kind of brotherhood called the Ancients. 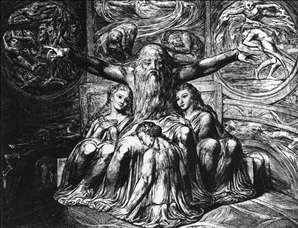 In art as in life Blake was an individualist who made a principle of nonconformity. He had a prejudice against painting in oils on canvas and experimented with a variety of techniques in colour printing, illustration, and tempera. His work as an artist is almost impossible to divorce from the complex philosophy expressed also through his poetry. He believed that the visible world of the senses is an unreal envelope behind which the spiritual reality is concealed and set himself the impossible task of creating a visual symbolism for the expression of his spiritual visions. He refused the easy path of vagueness and misty suggestion, remaining content with nothing less than the maximum of clarity and precision. 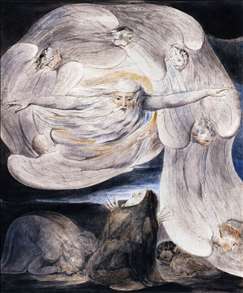 To most of his contemporaries Blake seemed merely an eccentric, and his genius was not generally recognized until the second half of the 19th century. (Rossetti  another painter-poet with mystical leanings  was an early champion.) His output was enormous; there are important collections in the British Museum, the Tate Gallery, the Fitzwilliam Museum, Cambridge, and several American museums. 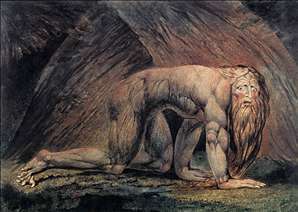 See more details about "Job and his Daughters"
See more details about "Nebuchadnezzar"
See more details about "Isaac Newton"
See more details about "Hecate or the Three Fates"
See more details about "Los Entering the Grave"
See more details about "The Descent of Christ"
See more details about "Los"
See more details about "Job Confessing his Presumption to God who Answers from the Whirlwind"
See more details about "Christ as the Redeemer of Man"
See more details about "Elisha in the Chamber on the Wall"